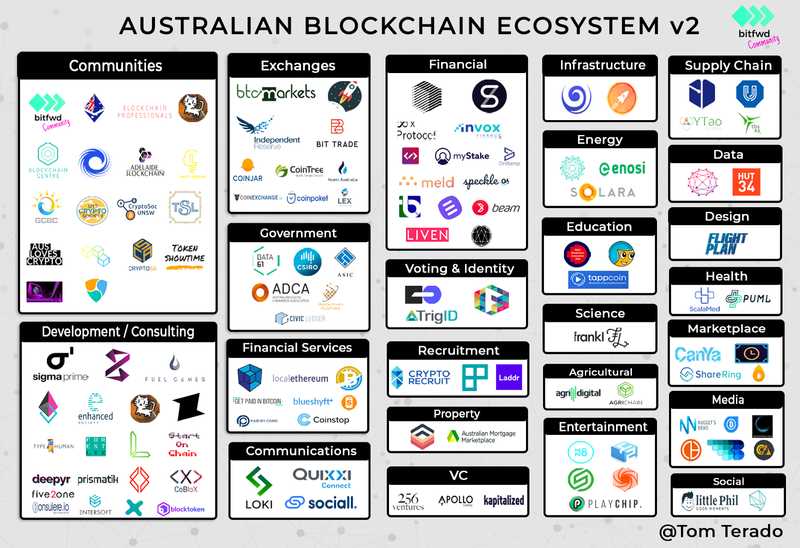 With the Blockchain industry constantly evolving, the Australian ecosystem is also moving forward with a lot of progress. 2017 was a big year for the industry with the ICO boom with notable projects such as PowerLedger, Canya, Republic Protocol and Synthethic (Havven) putting Australian on the global radar. After spending some time in the ecosystem and getting to know the wider crypto community through places such as DevconIV, I can confidently state that the caliber of Blockchain developers and entrepreneurs in this space parallels those from the US, Europe and Asia. For projects that are missing, please feel free to comment your information to the Google Doc. All of these graphics are done voluntarily so please be patient for the next update. Bitfwd community: Grassroots community of cypherpunks, Blockchain developers, entrepreneurs, and crypto enthusiasts. SydETH: Meetup to discuss the potential of the Ethereum platform, the wider blockchain and crypto ecosystem, and to share or collaborate on blockchain-based projects. Blockchain Professionals: Meetup for professionals is a forum to discuss Blockchain and other digital emergent technologies. BokkyPooBah Ethereum Workshops: Cater for people at different skill levels interested in working in the Ethereum ecosystem, whether for a career or a hobby. Blockchain Centre (Melbourne): State of the art coworking and shared office space for startups working in blockchain technology. Blockchain Centre (Sydney): Promote the development of Australian blockchain industry and establish Australia’s core position in the global blockchain sector. Consensys: Global organism building the infrastructure, applications, and practices that enable a decentralized world. Adelaide Blockchain: Initiative out of University of Adelaide and Flinders University that dedicates their time to engage and educate individuals on all aspects of Bitcoin, Blockchain and Web3.0 technology. GoldCoast Blockchain: collection of heads on the GC together who are interested, developing, selling or researching all things Blockchain related. UTS CryptoSoc: Educate individuals, groups and organisations on the benefits of integrating Cryptocurrencies and its derivatives into every day societal functions. CryptoSoc UNSW: Educate students on the unlocked potential of the architecture behind the Cryptocurrency network — Blockchain technology. Tank Stream Labs (Blockchain Hub): Bring together the Australian blockchain community and Tank Stream Labs has a proven track record of creating a successful technology start up community. CryptoSA: Facilitate Blockchain startups to rapidly grow their Tokenomic in quality and scale. Token Showtime: Cultivating a flourishing community of Aussie crypto enthusiasts. FuelGames: Performant, scalable blockchain infrastructure for world-class video games. Zed: Web3 software cooperative focused on product management and open source. Latitude Blockchain Services: Latitude is a startup accelerator and blockchain advisory company providing the services and expertise to take your startup to the next level! Entersoft Security: Blockchain Cyber Security, Smart Contract Audits, Pen Testing, Wallet Security, ICO Security, Crypto Exchange Security. BTCMarkets: Secure, reliable, transparent marketplace for trading blockchain assets. Australia’s first ADCA Gold Certified Exchange. Coinstop: Buy and Sell more cryptocurrencies than any other exchange in Australia. Coinjar: Simplest way to buy and sell popular digital currencies. Huobi Australia: Leading digital asset exchange in Australia. Local Ethereum: Peer-to-peer Ethereum marketplace. Travel By Bit: Opening the World to Digital Currency Tourism. Search and book flights, accommodation, tours and more. Pay using cryptocurrency. Coinstop: Australia’s leading cryptocurrency hardware provider. Strayacoin: POS enables businesses to accept cryptocurrencies. Paid By Coins: Fast and secure bill payments service that lets you pay bills via BPAY or pay directly to any Australian bank account using major cryptocurrencies. Synthetix (formerly Havven): Cryptoasset-backed network that enables the creation of on-chain synthetic assets. Republic Protocol: Decentralized dark pool exchange protocol, for trading large volumes of digital assets. 8x Protocol: Protocol built on Ethereum that enables decentralised repeating payments. Meld.gold: World’s first truly tradable global currency. Speckle OS: Building the new web on Polkadot. BEAM: Pay with your phone,earn rewards. Tenzorum: portal to use the web of the future in your devices, today. It allows you to get the full benefits of decentralization without compromising on user-experience or security. PowerLedger: Australian blockchain-based renewable energy trading platform. Flux Party: Your way to participate directly in parliament. Empowering people in government decisions directly through technology. Laddr: World’s first, anonymous hiring platform where software engineers are in control. AgriChain: World’s most comprehensive agricultural supply chain software solution. Gazecoin: Patent-registered blockchain platform measured by gaze control/eye tracking. Skrilla: Utility token used as the core medium for exchange on the Skrilla fantasy esports platform. 256 Ventures: Global cryptocurrency fund, investing in and managing a portfolio of diversified digital assets. Cryptofinder: Your guide to the the latest in cryptocurrency, blockchain, distributed ledger and beyond. Blockchain Brad: Teach to learn and learn to teach. Cryptocurrency educator. Crypto Australia: Cryptocurrency Australia produces Bitcoin, Blockchain and Crypto content for the everyday hodler. Decentralised Podcast: Founders, developers and people in the blockchain space talking revolutionary technologies in cryptocurrencies and beyond. ShareRing: World’s only trusted web platform for sharing goods and services. Flight Plan: Design suite for blockchain that provides you with access to design expertise and a platform for rapidly launching a working blockchain prototype. Little Phil: Give on your terms and in your own time, knowing you have complete transparency and control over where your money is going — just like a philanthropist would.